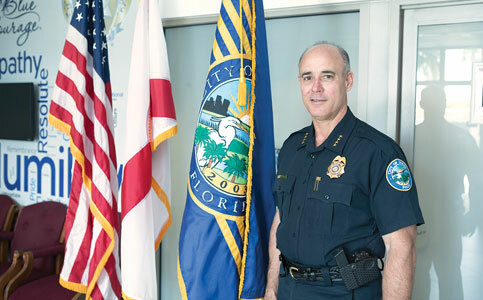 After a two-year retirement from the Miami-Dade County Police Department, Hernan Organvidez returned to public service this year as chief of police for Doral. During his 32 years with the county, Mr. Organvidez said he always had a special connection with Doral, even before it was incorporated as a city. His work routinely brought him back to Doral. Before the city ran its own police department, it contracted its policing services to Miami-Dade County. During the time, Mr. Organvidez was the commander for Doral. While working with Doral in the early 2000s, Mr. Organvidez became the first-ever police officer to represent Doral and graduate from the FBI’s National Academy. Over the next few months, Mr. Organvidez says, he will be hard at work pinpointing the department’s strengths and weaknesses. Then he will begin his three directives from Doral’s council: increase police visibility, strengthen school safety and ramp up traffic enforcement. Though Mr. Organvidez has numerous ties to Doral, he still considers himself an outsider. His ultimate goal, he says, is to create an internal structure where existing police officers in the City of Doral can have successful careers within the department, ultimately running it themselves. “I want this department to stand alone and hire from within … so it doesn’t have to look outside for new leadership,” he said. As for how he is to run the department, Mr. Organvidez says his philosophy is simple: be honest and fair. “Always do the right thing and we can move forward together,” he said. Miami Today reporter Gabi Maspons interviewed Mr. Organvidez at the City of Doral Police Department.